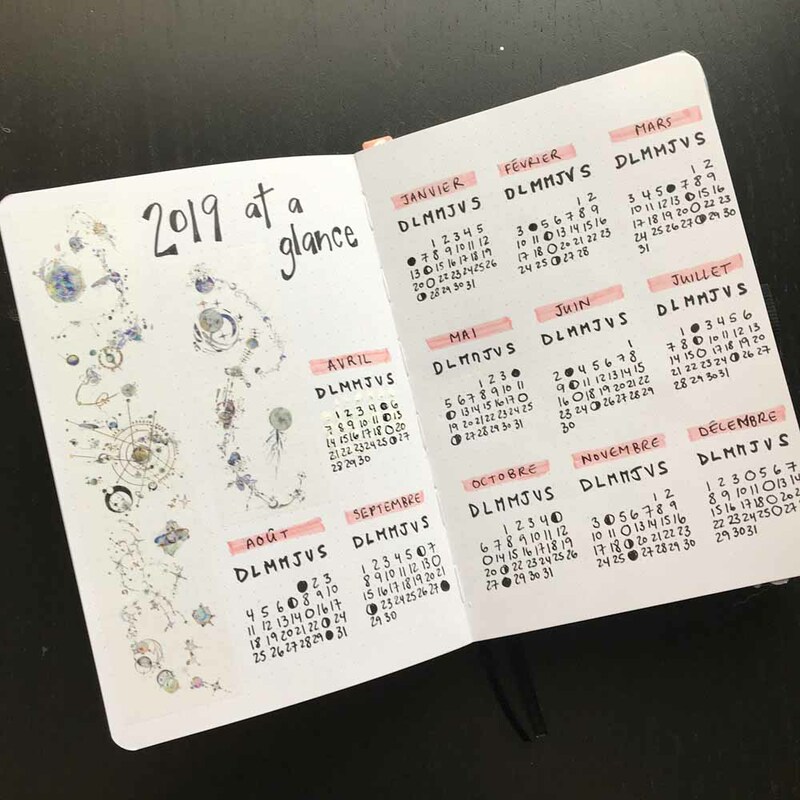 In 2019, I decided not to buy a planner and to try my hand at a bullet journal/planner hybrid. 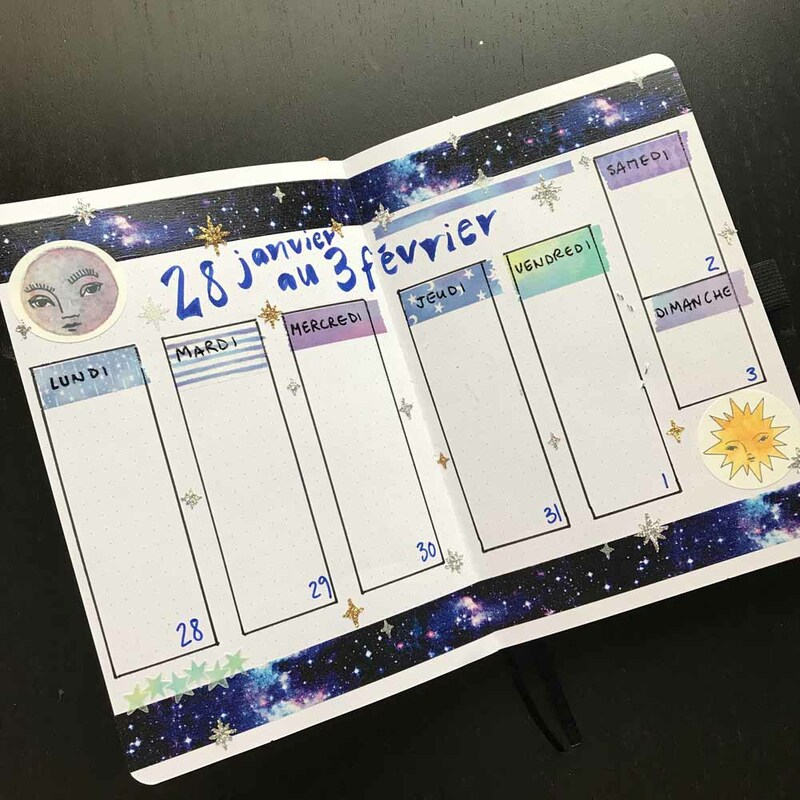 I have an insane amout of stickers and washi tapes and I was looking for a way to use them. I bought this beautiful journal from Archer and Olive. What did it for me was the 160 gms pages. 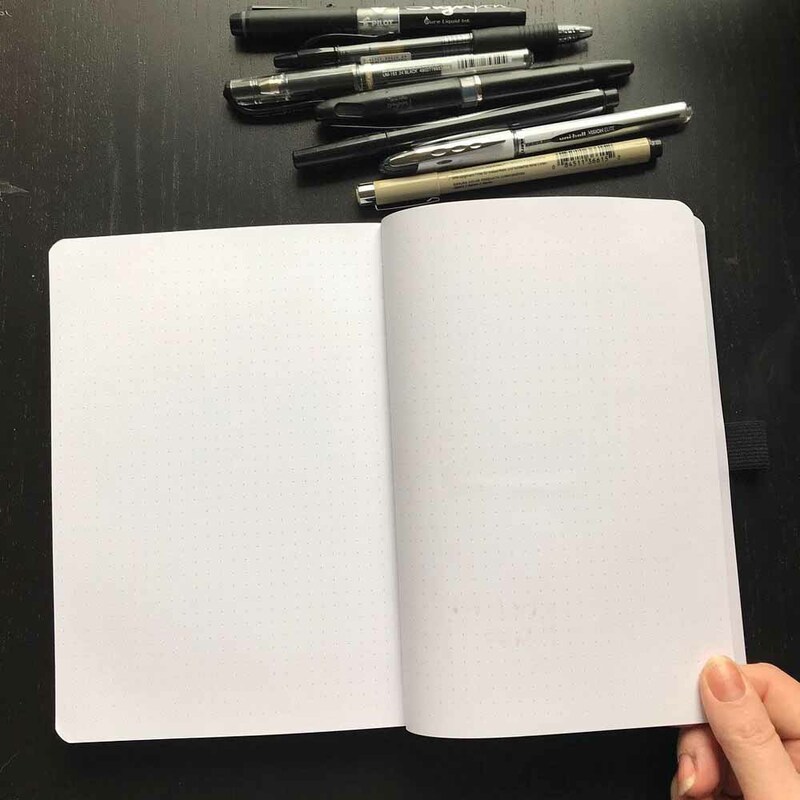 I always start a new journal with a pen test page. And look: no bleed through! 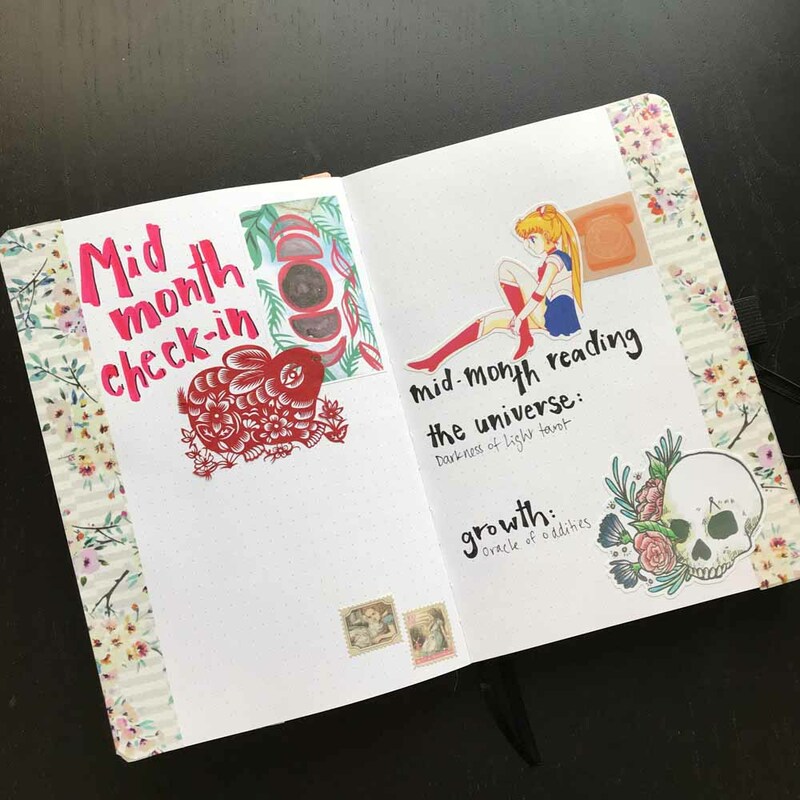 I included a page with my One Little Word for the year. 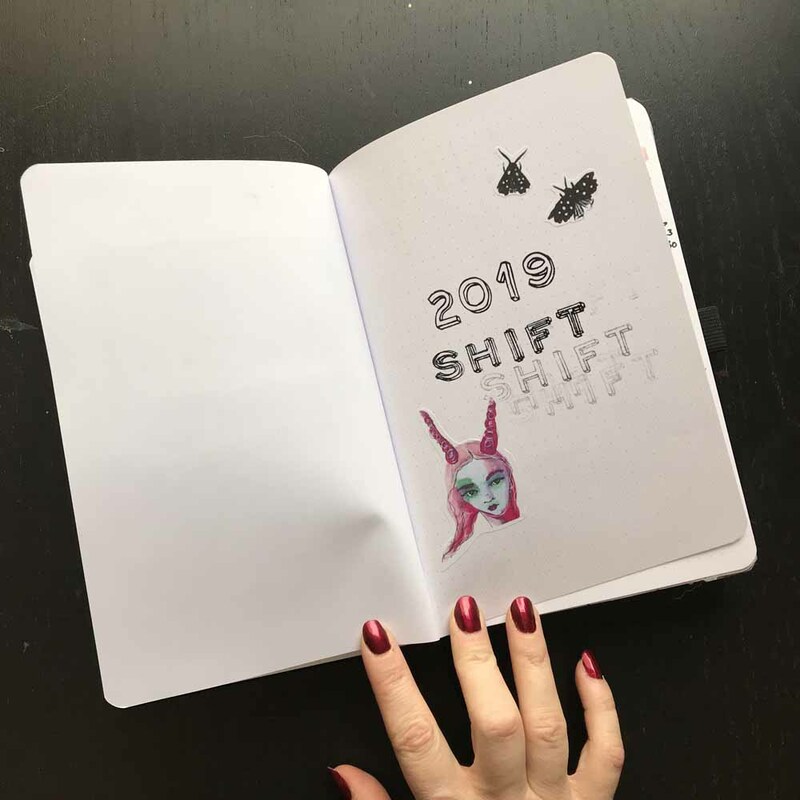 My bojo will have a definite witchy feel to it (I use the hashtag #vswitchybujo on IG if you want to follow) as I am exploring the link between art and ritual more and more. 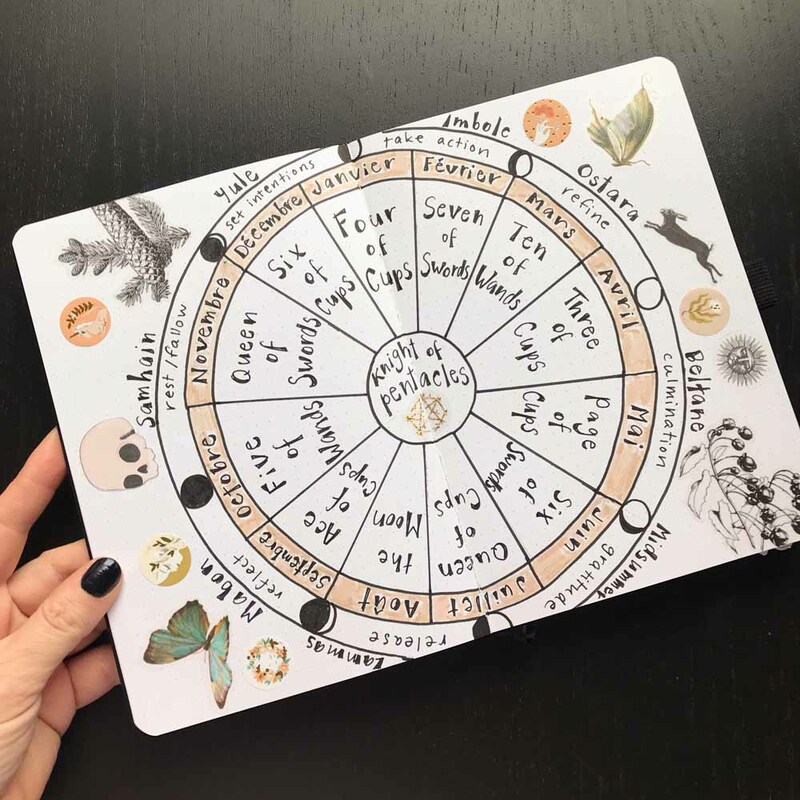 One of my first spreads is the Wheel of the Year. The design is adapted from Yaritza’s beautiful design. I added all of the cards I pulled for my year ahead reading. 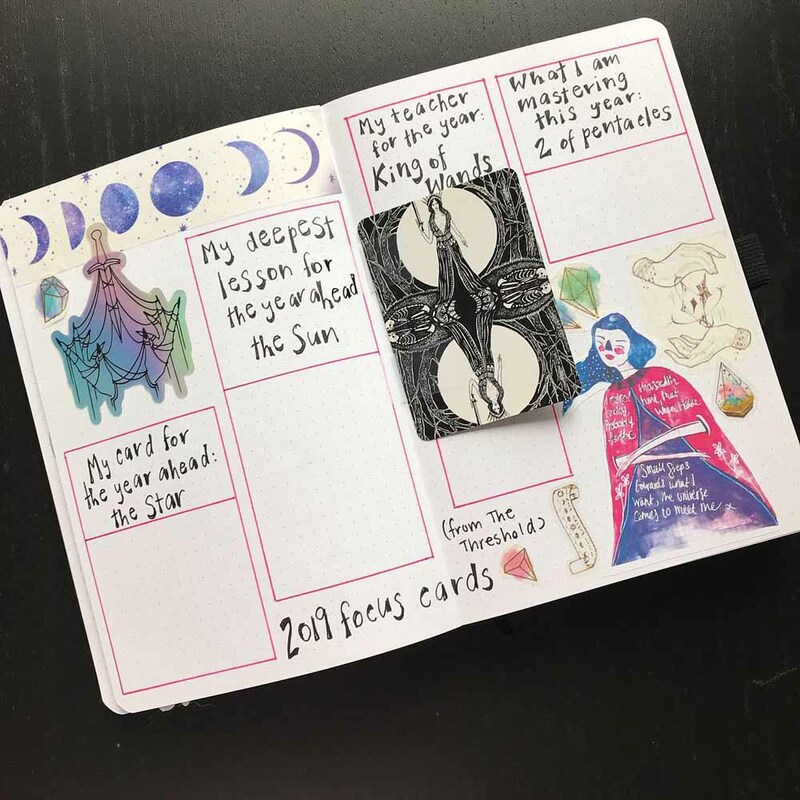 I also did a page for the five focus cards of 2019 that I pulled after doing Lindsay Mack’s The Threshold workshop. I like the idea of having a space to hold the teacher cards for the year as well as all of my planning. I have a year at glance page where I can see when the different moon phases are. 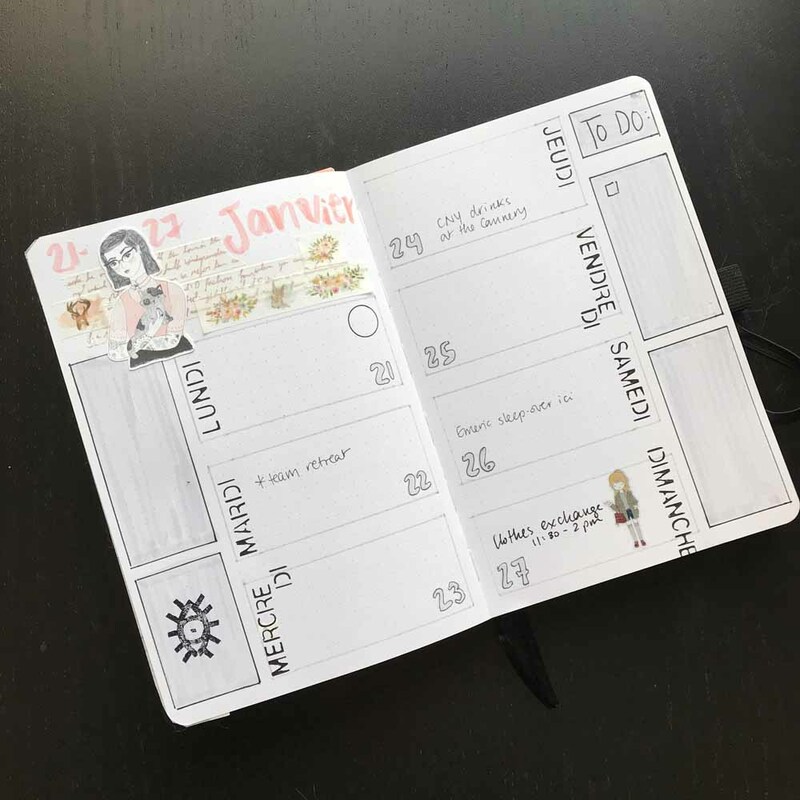 I am still figuring out my system, but I start the month with a calendar. I will have three focus items on that page. The following spread if for my monthly card. It is in two parts: the first part is for my initial interpretation of the card and then I will revisit it at the end of the month. 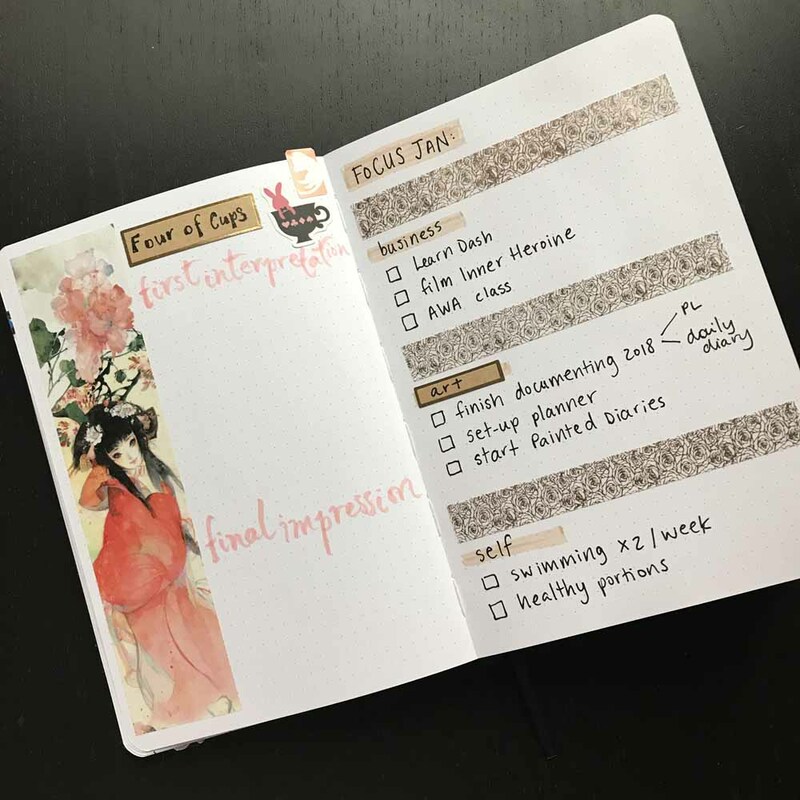 The right page is for more detailed focus items. 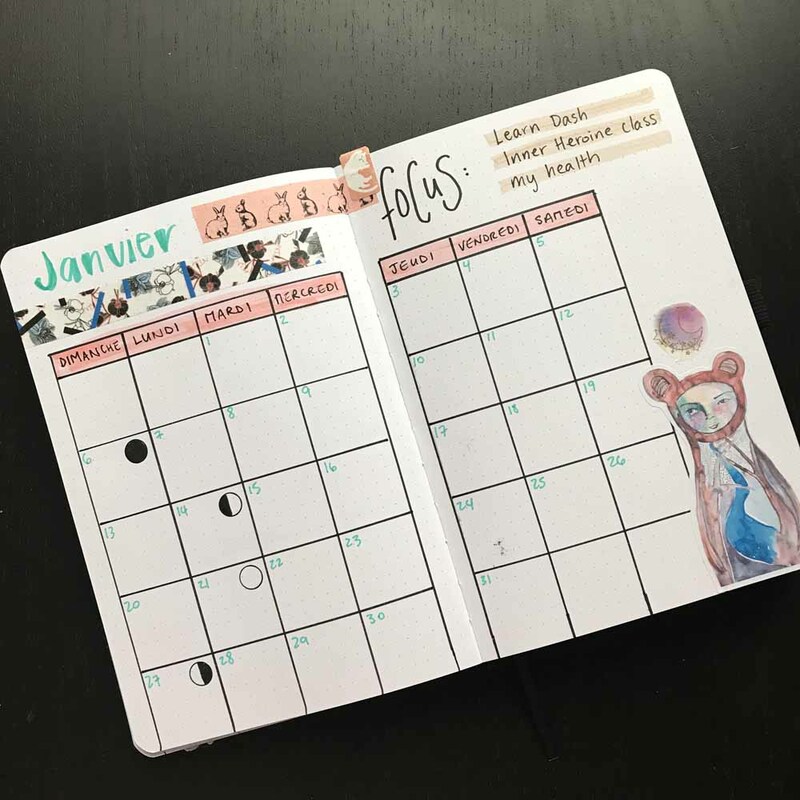 I don’t really use trackers but this will be a brain dump / to do page for each month. 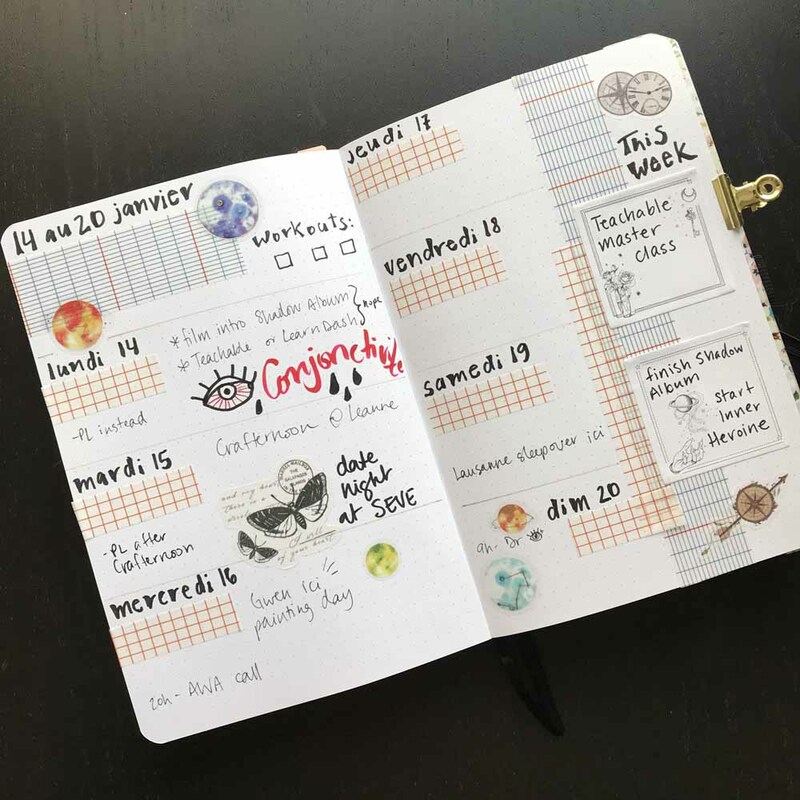 I also have weekly spreads. The first one I did was Sunday to Saturday but I decided to change them to a Monday to Sunday week because that suits me better. 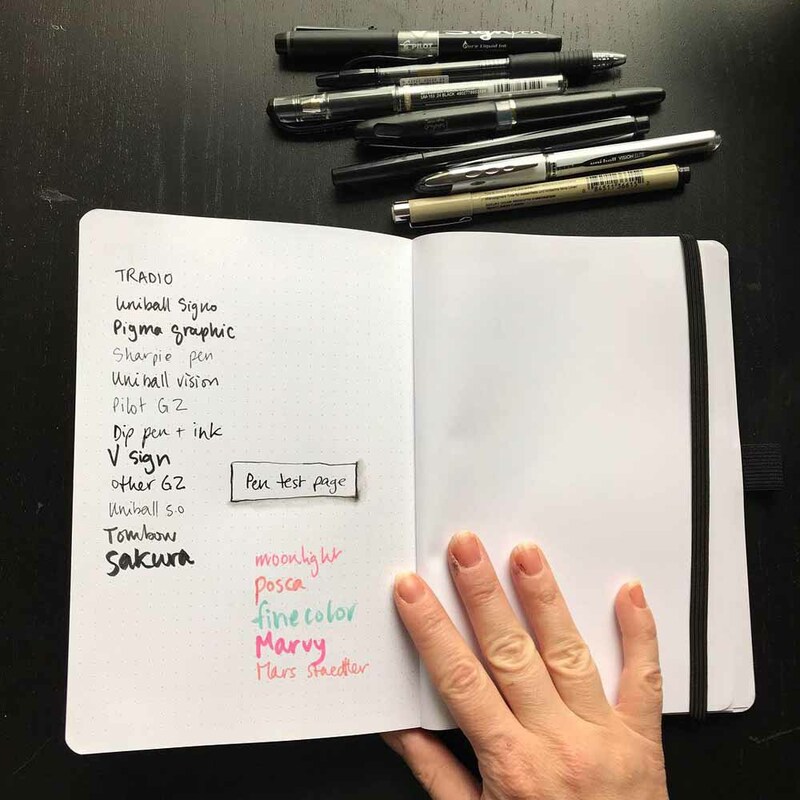 There is always a space for me to put notes or ideas or to do lists. I am definitely not a good stamper but I enjoy carving them and have a few select ones that I keep. I am so glad that now I have a place to use them. In the middle of each month, I decided to add a check-in page. 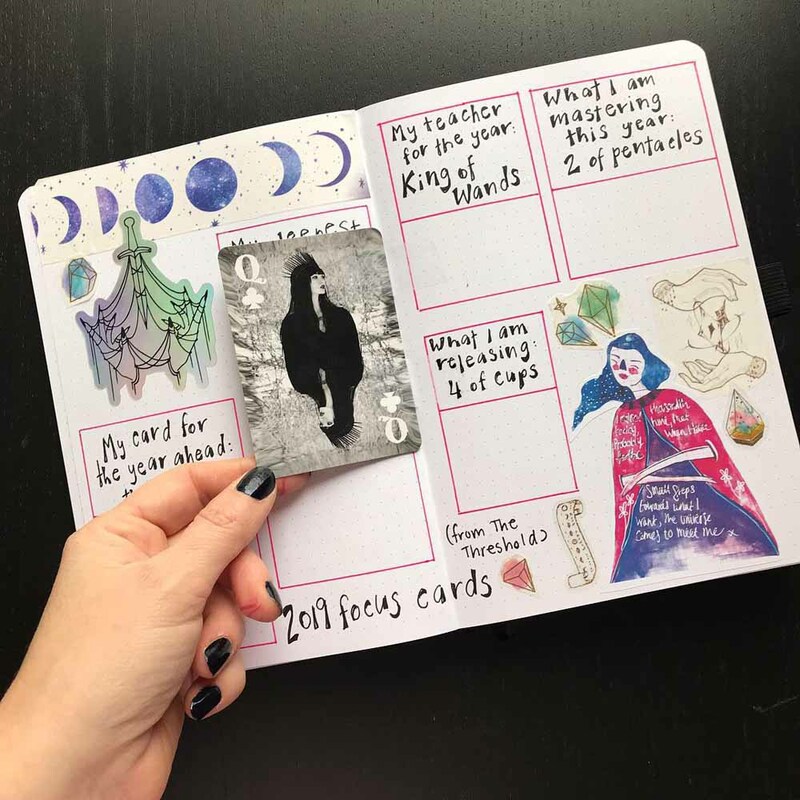 I will pull a card (or two) and then journal about it and anything else that is on my mind. 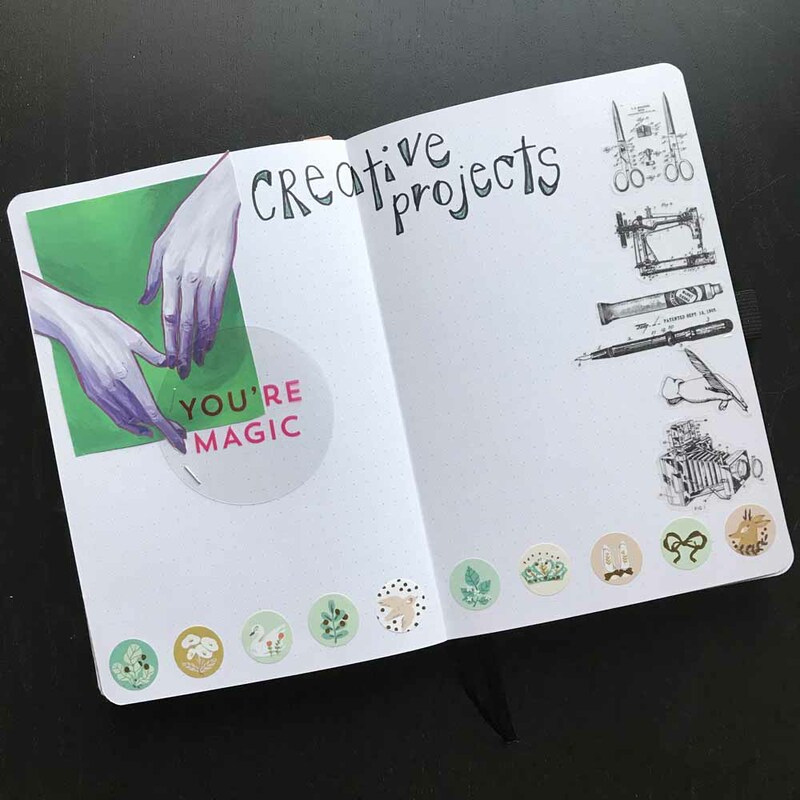 After the last two weeks of January, I added a projects page. I thought it would be a cool placeholder for all that I will be working on this year. that way, at the end of the year, I can come back to this page and view all my projects. I’ve already started filling it in as I have an idea for the 100 Day Project. Most of the stickers throughout are from Freya Fennec on Etsy and Elly Mack as well. I also use my extensive washi collection. I would love to know what you are using this year! Let me know in the comments.